Chime is a unique, charming tale. They prose isn't typically what you would find in a paranormal YA. As a matter of fact, I'm not sure I would put Chime entirely in that genre, with its dashes of steampunk, historical fiction and magical realism influences. 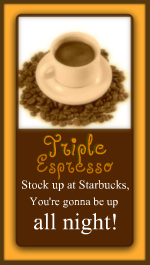 It took me a hot minute to get into because of the writing style, but once I did I was hooked. Briony is depressed and self-loathing, yet charming, hilarious and loving at the same time. She is a well-written, complex character, whose sense of duty and guilt keeps her in a perpetual state of mental anguish. Briony's love interest, Eldric, is one of the best written male protagonists I have seen in a long time. He's charming, funny, patient, intelligent and thoughtful. Their relationship is slowly developed and by the end, I was as in love with him as Briony (instead of scowling and annoyed as I can sometimes get over typical YA males/stalkers). 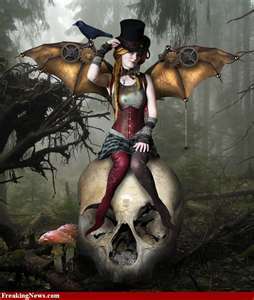 Magical elements come into play via the town's swamp and its cast of characters such as: The Boogey Mun, witches, the Chime Child, Dead Hand, Mucky Face Brownie, Bleeding Hearts and many more. 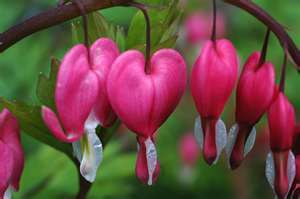 Bleeding Heart plant. Now imagine them whispering and singing to you about cute boys. The mysteries of Chime were easy enough to figure out, but revealed in a calculated way that I enjoyed. Instead of being frustrated that the characters haven't figured out the secrets yet, I was anxious to see how everything turned out. 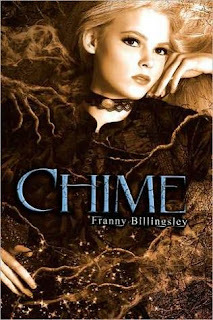 In Chime, Billingsley has produced an amazing little gem of a novel and I'm keeping my fingers crossed for a sequel. This one is new to me. I love the cover! The cover is so pretty isn't it? I really liked this book. It was different, but in a good way. I really think you'll like it.